We do not state the prices of all items for the safety and privacy of our clients. Probably the most famous Victorian glasshouse was located in Stourbridge, England. 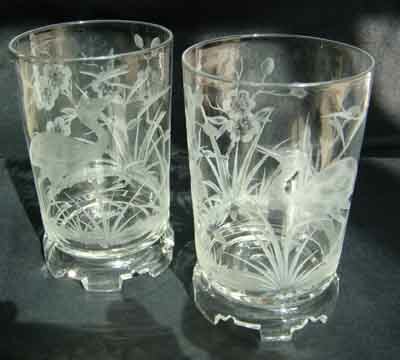 Known for innovative design and techniques in glassmaking. decorated with convolvulous flowers, Stourbridge, c.1880. Whilst only 3 1/4in (8cm) high this vase has the desirable butterfly to rear. This butterfly is understood to be a 'signature' on Webb glass. on crenellated Feet, engraved with storks in aesthetic manner, Stourbridge, c 1885, 4 1/2in (11.5cm) high approx. decorated with trailing ivy, Stourbridge, England, c.1880, 12in (30.5cm). 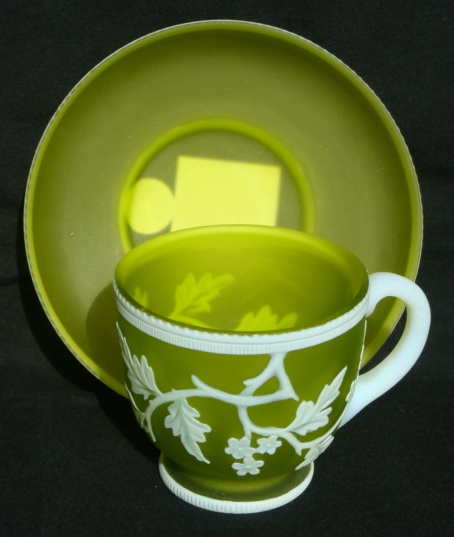 Reverse of the Thomas Webb Three Colour Cameo Vases. 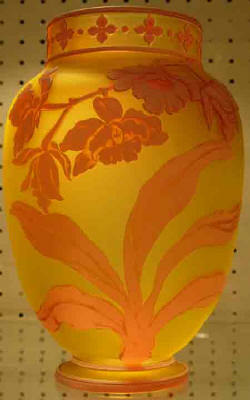 A detail from the Thomas Webb three colour cameo vases. 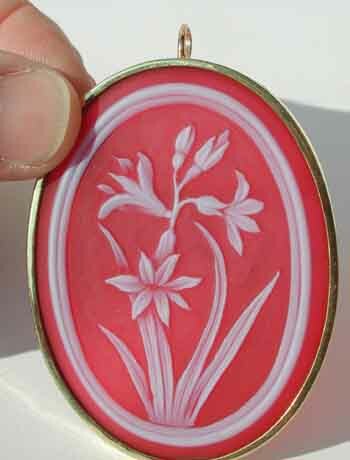 the body cut with alternate bands of cameo and intaglio work, silver mounted, hallmark for London 1888, 5 3/4in (14cm) approx. 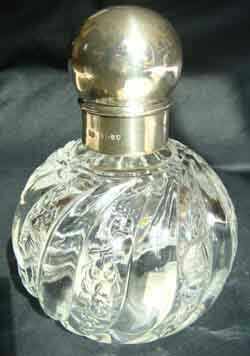 More Thomas Webb Scent bottles on the 'Scent Bottles' page. decorated by Daniel Pearce & Lionel Pearce, 1889-1905.
decorated with Acorn and Oak leaves pattern designed by Jules Barbe, acid etched mark Thomas Webb, Burmese and rarely seen Rd number to base 60167, 3 1/4in (8.5cm). decorated with orchids, signed Thomas Webb & Sons c.1885, (8in 20.5cm) approx. This extremely rare vase was commissioned by Aberdeen City Council from the manufactury of Thomas Webb, Stourbridge as a wedding gift for Princess Mary. Thomas Webb and Sons commissioned Fereday and Fritsche to engrave the vase with Egyptian motifs inspired by the search for the Tomb of Tutenkhamun,and the contemporary vogue in England and Europe for all things Egyptian. See Glass and Pottery as Royal Wedding Presents, The Pottery Gazette and Glass Trade Review, April 1992 edition and Hadjamach - 20th Century British Glass, p.240. on honeycomb body, with four colours showing, c 1902, 3 3/4in (9.25cm) approx. white cameo overlay cut through to pale yellow with a Peacock Feather, c 1885, etched TW&S banner mark to base, 9in approx. 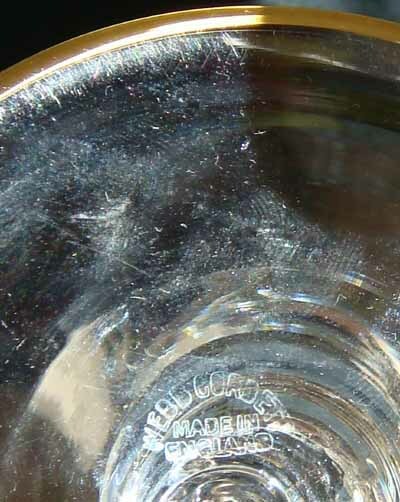 A detail of the peacock feather eye is on the Thomas Webb & Sons HISTORY page. Click on link at the top of this page. carved with marine subjects, silver plated mounts, Stourbridge, c.1888, 6in diam (15cm) approx. of 'convulvulous flower' form, 5in (12cm) approx diam.